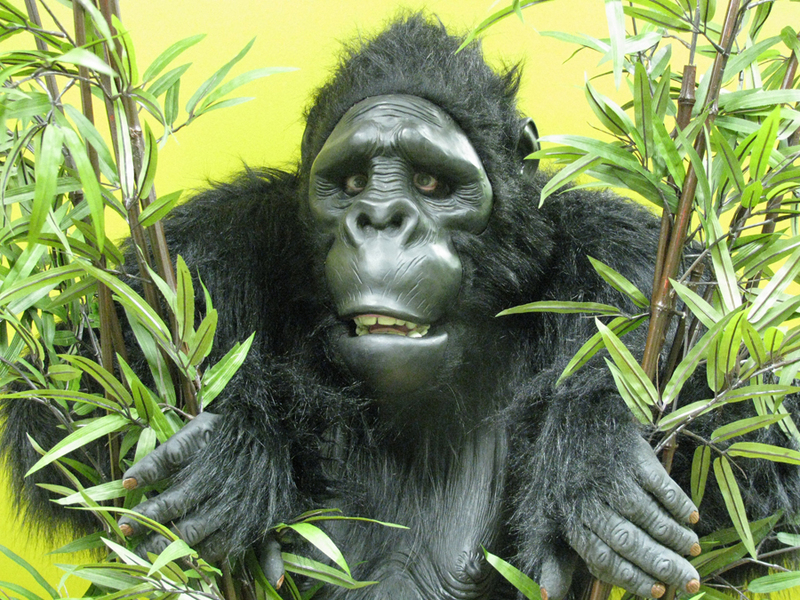 Old Bongo wants to take a moment to introduce you to a new gorilla friend for us to play with! 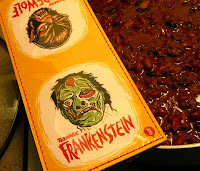 While browsing through the Classic Horror Film Board a couple of years ago,I happened upon an amazingly talented gentleman named Jeff Carlson. Jeff was displaying an incredible assortment of monster related designs based on the classic Mani-Yack iron on transfers from the 60's. The artwork and designs were all new, but so faithful in design and execution, that they were indistinguishable from the originals. Jeff was making these available both as vintage style vinyl wallets, or as t-shirts. 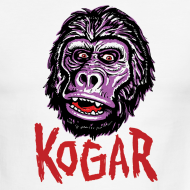 The design that REALLY caught my eye was none other than dear brother Kogar! Bob Burn's great apes Kogar AND Tracy, were brought to vivid colorful life by Jeff's skilled hands. I stared at those delightful images for countless minutes like a kid with a new Sears Christmas Catalog. A short while later, I got an email from Bob about a fellow who was working on a suit of his own , and would I mind giving him a little input. 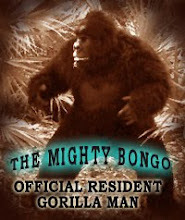 I'm always ready to support a fellow gorilla man, so I readily agreed. To my surprise, this seeker of gorilla knowledge was the self same Jeff Carlson! 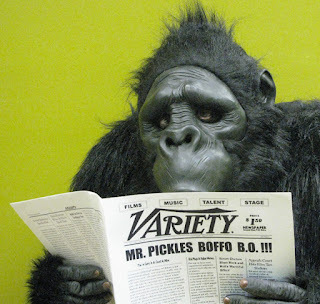 Jeff had already sculpted a wonderfully comic interpretation of a gorilla, with a look of un-adulterated mischief , thus was born Jeff's alter ego...Mr. Pickles! I could tell immediately that this was a labor of love for Jeff, and he was well on his way with it. I think I may have offered a few pointers about padding, but Jeff had everything else already accommodated for. His solution for the padding was eventually his own interpretation as well, and looked absolutely brilliant! I got an email from Jeff a short time later telling me that he was treading in Emil VanHorn's footsteps by booking a gig at a burlesque show, in the classic beauty and the beast style. 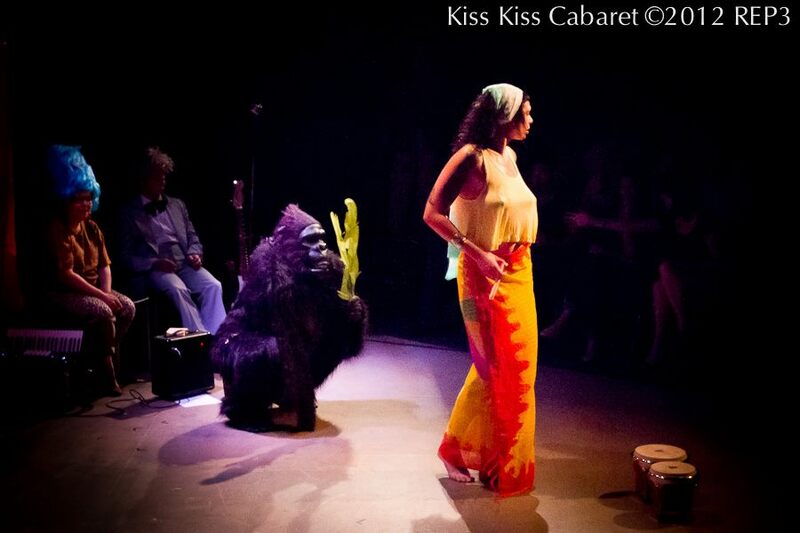 The rush of your first professional, or semi professional outing as a gorilla man is an unforgettable experience, and I think I was as excited as Jeff was! 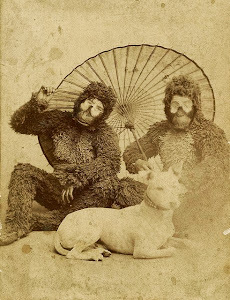 Jeff has kept at this new found addiction of being a gorilla, and participated with several more burlesque shows, and other promotional events. 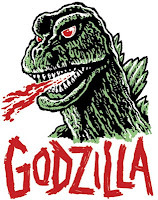 The design that currently catches my eye, (besides the Mr.Pickles shirt is this beauty! 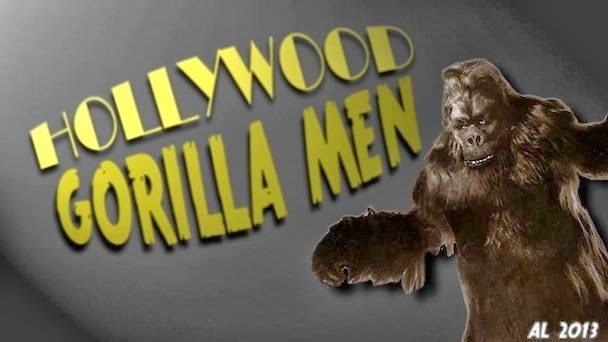 If this doesn't capture the essence of a gorilla man fan, I don't know what does! No die hard gorilla fan should be without one! So kick back and enjoy these photos of Jeff Carlson's ......Mr. Pickles ! Good old E-gor has dug up a real beauty of a photo this time ! Acquanetta played Paula Dupree, a mysterious beauty created from a gorilla by mad scientist John Carradine. I'll not comment on dear Acquanetta's acting, but lets just say she was really pretty to look at! Acquanetta also appeared in the sequel called "Jungle Woman", but was replaced for the third and final film in the series" Jungle Captive" by actress Vicky Lane. E-Gor's great photo features an autograph by Acquanetta, and a great view of Crash Corrigan doing what he does the best ! 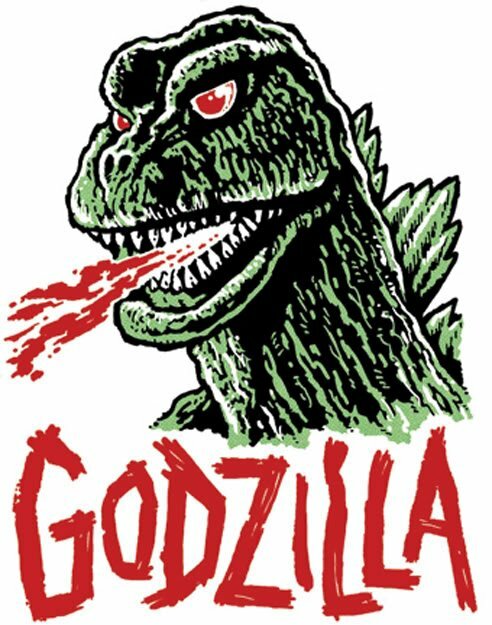 As a kid, I would stop in my tracks at the first sign of anything ape related on TV. I lucked out one day when my mother called me into the living room to look at the show she was watching. 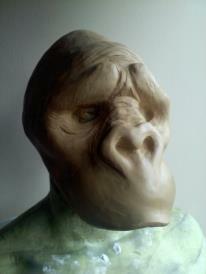 There on the tube,was an Orangutan interviewing an older gentleman about the make-up from the Planet of the Apes. 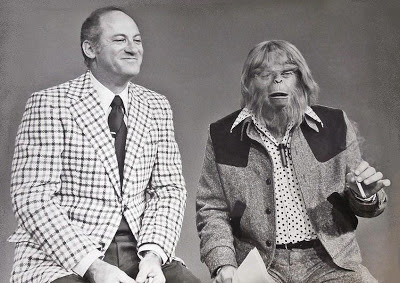 I listened for a while, and discovered that the simian interviewer was Mike Douglas himself ! 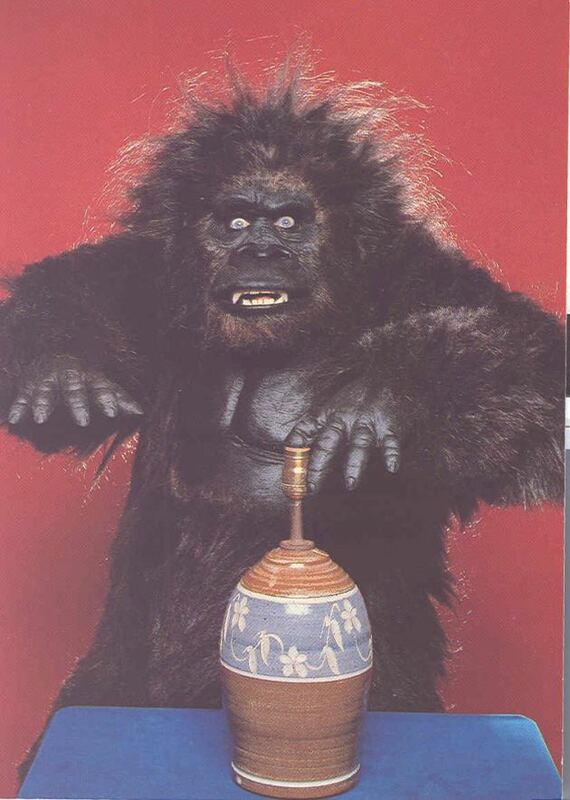 This was one of many TV appearances the denizens of the monkey planet made during the 70's. The smiling gentleman to the left of Mike Douglas is master Make-up artist Dan Striepeke. Striepeke and John Chambers received a special Oscar for their work on Planet of the Apes. This episode of the Mike Douglas Show originally aired on 9/17/1974. The world was a wonderful place for monkeys back then! 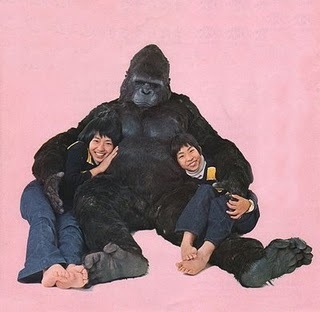 Happy Valentines to all lovers of gorilla movies! To help celebrate, here are a random batch of photos of girls, and the gorillas that love them. Here is a very cool poster, for Charlie Chan at The Circus, starring Warner Oland. The artwork is beautifully done in classic noir-ish style. The brightly colored hero and heroine are being watched over by the somber toned looming visage of Charlie Chan. They are all being stalked by a monstrous beast of a gorilla emerging from the shadows.....Now that's a poster!!! 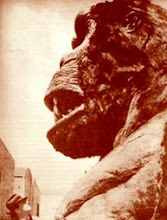 From what I was able to make out on this print on YouTube, the gorilla appears to be one of Charlie Gemora's gorilla suits. Who's in the suit? Well...I've come to realize that you can't judge an ape by it's cover. There have been recent discoveries of other men wearing Charlies outfits, and those who had suits built by Charlie. 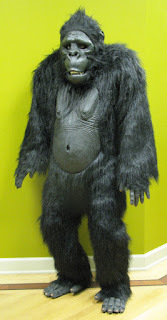 Because of this confusion,(the norm for gorilla men) it's damned hard to say who exactly this little gorilla is. Whoever it is, he does one hell of a good job as this fierce Little beastie! Have fun at the circus kids! George has been instrumental in finding a ton of gorilla goodies and simian signatures as he tirelessly scours the web, and auction sites for an undiscovered gorilla treasure, and generously shares them here! So lets get E-gors Gorilla Goodies kick-started with autographs of two of the stars of the classic Saturday morning series...Filmation's, The Ghost Busters! 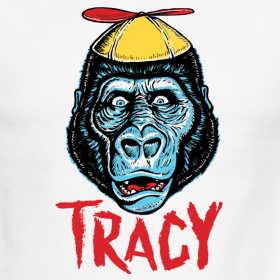 The show that made Tracy the gorilla a household name, and introduced an entire generation to the coolness of Gorilla Men! 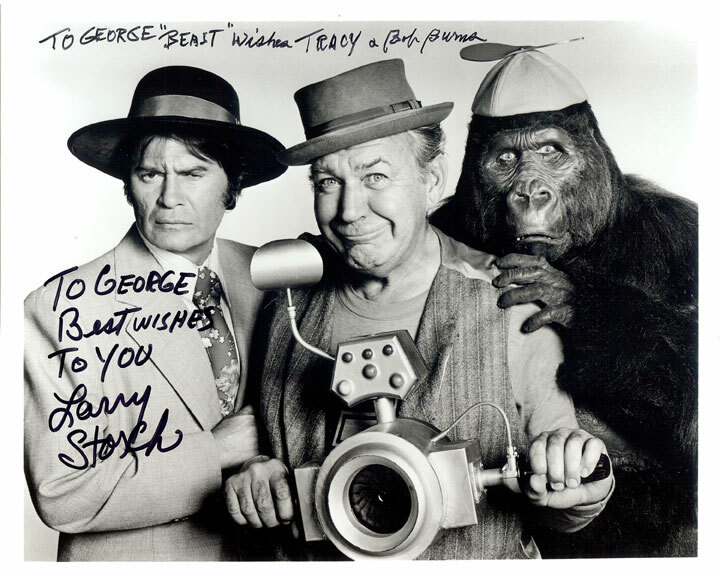 This great photo is autographed by Larry Storch and Bob Burns, "Spenser and Tracy" respectively. 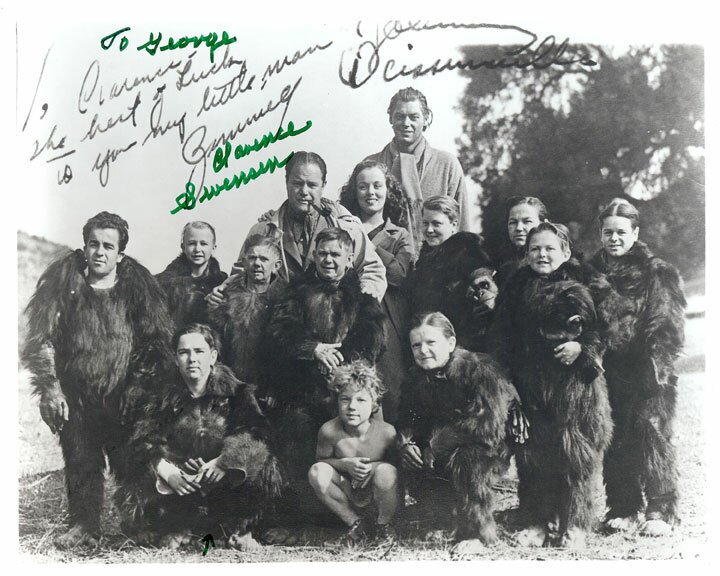 They are on either side of the late Forrest Tucker as the leader of the Ghost Busters, "Kong". Keep watching here gang, for more monkey madness from old "E-gor"!